Elsa Vorwerk was born on 26 September 1897 in Niagara Falls, Niagara County, New York. The following appeared on 27 September 1897 in the Niagara Falls Gazette: Mr. and Mrs. August Vorwerk of North Main Street are happy over the arrival of a little daughter. Her name was recorded as Elizabeth in Zion Lutheran Church records and the 1900 census. A photographic portrait was made of Libby and daughter Elsa about 1898. 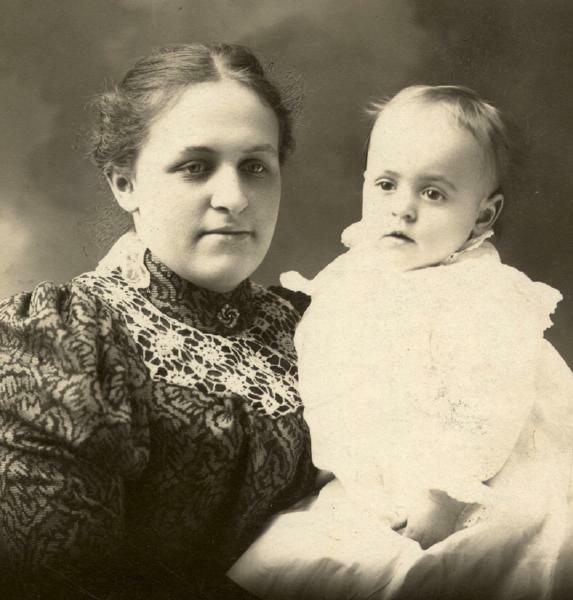 She was baptized/christened on 4 September 1898 at Zion Evangelical Lutheran Church in Niagara Falls, Niagara County, New York, sponsored by Ada Anna Kammerer. August Vorwerk and Elizabeth Susanna Margaret Kammerer appeared in the US federal census of 1 June 1900 in Niagara Falls, Niagara County, New York, at 2132 Main Street. Other members of the household included Elsa Vorwerk. Adam and Lucy Kammerer and their family were photographed during 1902 in their front yard at 1366 Ontario Avenue. August Vorwerk and Elizabeth Susanna Margaret Kammerer appeared in the New York state census of 1 June 1905 in Niagara Falls, Niagara County, New York, at 1324 Ontario Avenue. Other members of the household included Elsa Vorwerk. 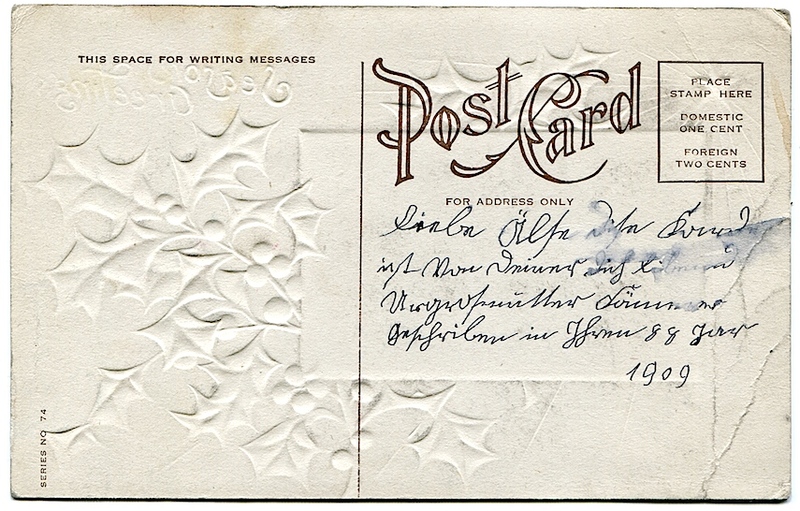 Dear Älse, This card is sent to you from your great-grandmother Kämmerer, who loves you. Written in the year 1909. August Vorwerk and Elizabeth Susanna Margaret Kammerer appeared in the US federal census of 15 April 1910 in Niagara Falls, New York, at 1324 Ontario Avenue. Other members of the household included Elsa Vorwerk, Frederick Augustus Vorwerk. Lucy Weiler Kammerer was photographed about 1912 with daughters Helen and Marie, Addie and Charles Gaise, and Elsa Vorwerk. August Vorwerk and Elizabeth Susanna Margaret Kammerer appeared in the New York state census of 1 June 1915 in Niagara Falls, New York, at 1324 Ontario Avenue. Other members of the household included Elsa Vorwerk, Frederick Augustus Vorwerk. The following appeared on 30 June 1916 in The Buffalo Morning Express: The marriage of Miss Gertrude Barnett, daughter of Mr. and Mrs. George W. Barnett, and Joseph F. Lepine was solemnized at 7 o'clock last evening in the Presbyterian church of the Covenant, the Rev. John D. Campbell officiating. The church was decorated with palms, evergreens, pink peonies and marguerites. Ropes of Smilax were caught from the chandeliers. The pews for the house guests were marked with pink peonies and marguerites. Carl Kammerer of Niagara Falls, cousin of the bride, played a programme of organ music as the guests were assembling, ending in the Lohengrin bridal chorus as the bridal party entered, led by the ushers, Myron B. Bloy of Detroit, Mich., and William Lewis. The ushers were followed by the maid of honor, Miss Myrtle Hutchinson, and the two bridesmaids, Miss Helen Kammerer of Niagara Falls and Miss Ruth Barnett, sister of the bride. The bride entered with her father and was met at the altar by the bridegroom and his best man, George J. Barnett. She wore a gown of pussywillow taffeta with lace and pearl trimmings. Her veil was fastened with orange blossoms and she carried a shower bouquet of bride roses and lilies of the valley. The maid of honor, wore green-flowered voile trimmed with green satin bands and carried an arm bouquet of Ophelia roses. Miss Kammerer wore pink-flowered voile trimmed with pink satin bands and carried an arm bouquet of pink Killarney roses. A reception to 100 guests at the home of Mr. and Mrs. Barnett in Waverly street followed the ceremony. Palms, pink and white peonies and roses adorned the rooms. The bride's table was laid for fourteen and was centered with pink roses. The other guests were seated at small tables which were centered with pink candelabra. The guests included Mr. and Mrs. John Guenther of Welland, Ont., Mr. and Mrs. Frank L. Barnett, Miss Nettie Platt of Alden, J. A. Kammerer of Toronto, Ont., Mrs. and Mrs. M. H. Mayle, Miss Helen Mayle, Mr. and Mrs. Louis K. Eimer, Paul Eimer, Mr. and Mrs. Francis Ford, Mrs. Adam Kammerer, Miss Marie Kammerer, Mr. and Mrs. Charles Ford, Miss Louise Ford, Charles Ford, Jr., Miss Norma Hoffman, Miss Alice Young, Mr. and Mrs. George Benning, Miss Elsa Vorwerck of Niagara Falls, Mr. and Mrs. George F. Loehr of Lancaster, Miss Gladys Williams of Toronto., Ont., Mr. and Mrs. M. Bloy of Detroit, Mich., Miss Winifred Hewetson and Miss Vera Hewetson of Brampton, Ont., Miss Alma Hart of Scranton, Pa. Mr. and Mrs. Lepine will spend their honeymoon in the Catskill mountains and will be at home after August 1st in Buffalo. Carl Kammerer in uniform was photographed with the Kammerer and Vorwerk families. Elizabeth Susanna Margaret Kammerer appeared in the US federal census of 1 January 1920 in Niagara Falls, Niagara County, New York, at 1630-1/2 Ontario Avenue. Other members of the household included Elsa Vorwerk, Frederick Augustus Vorwerk. 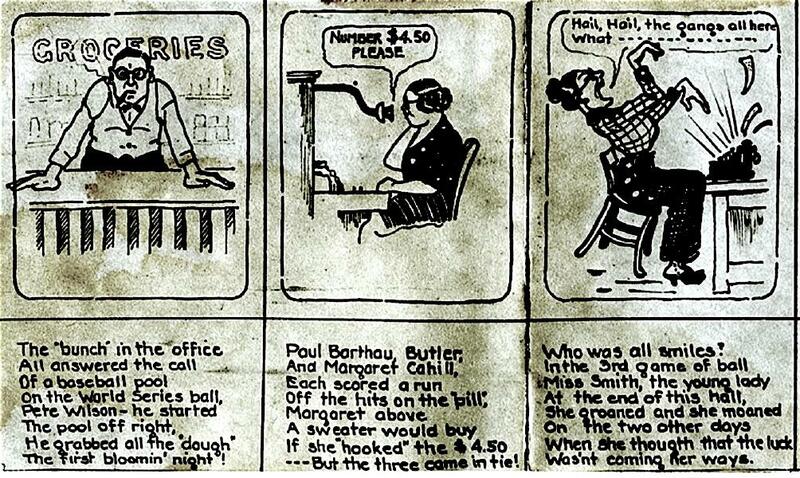 She was a stenographer at the alkali works, according to the 1920 census. 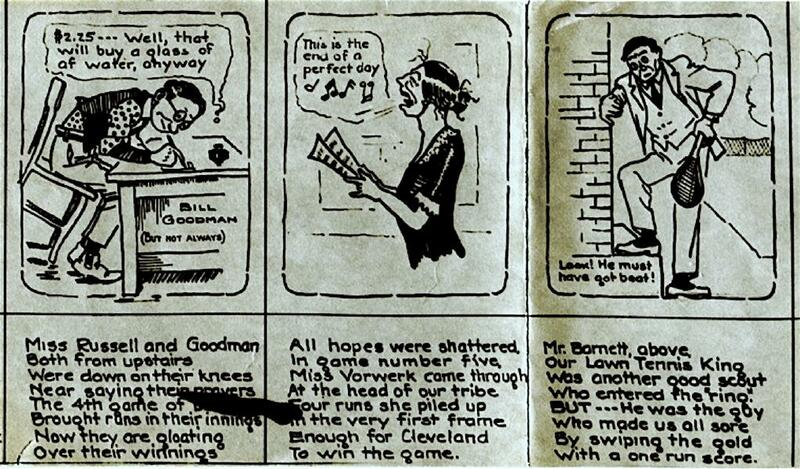 In October 1920, when both Pete Wilson and Elsa Vorwerk were working at the Mathieson Alkali Works in Niagara Falls, someone produced an amusing little cartoon-strip commentary on the results of the World Series office pool. A reunion of the Kammerer family was held in 1923 Kammerer family at the home of Helen Kammerer Hoffman, on the occasion of sister Phoebe Kammerer's Frank's visit from her home in Devil's Lake, North Dakota. Elizabeth Susanna Margaret Kammerer appeared in the New York state census of 1 June 1925 in Niagara Falls, Niagara County, New York, at 1636 Ontario Avenue. Other members of the household included Elsa Vorwerk, Frederick Augustus Vorwerk. She was employed as a bookkeeper, according to the 1925 census. 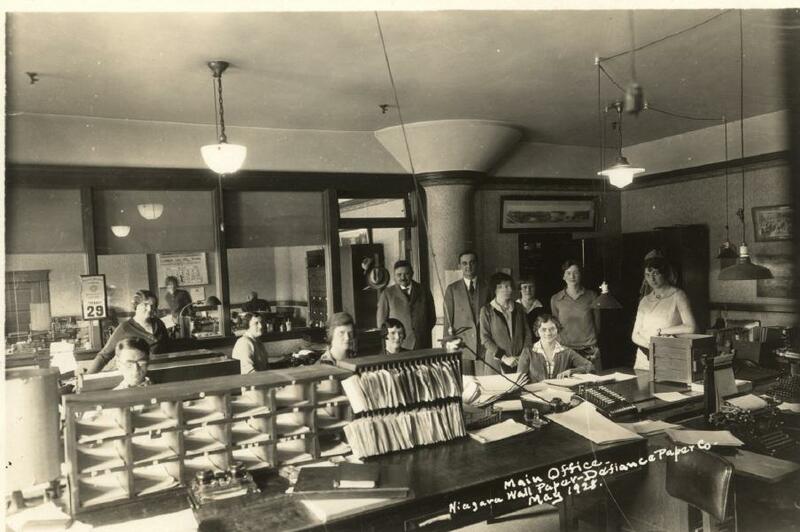 In May 1928, she was employed at Niagara Wall Paper Company, working in the office. Elizabeth Susanna Margaret Kammerer appeared in the US federal census of 1 April 1930 in Niagara Falls, Niagara County, New York, at 1638 Ontario Avenue. Other members of the household included Elsa Vorwerk, Frederick Augustus Vorwerk. 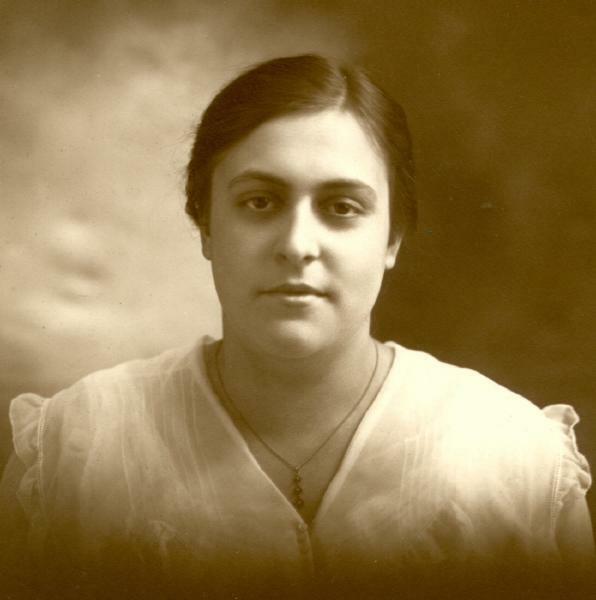 She was employed as assistant purchasing agent by a paper factory, according to the 1930 census. The following appeared on 1932 in The Niagara Falls Gazette: After having been defeated two weeks ago at Erie, the teeams of the Niagara Falls Tennis club made a strong effort to come back on Saturday, when the return match was played against the Erie Tennis club on the club courts in Pine avenue, but the visitors proved too strong for the best local talent, and won the tournament by a score of 10 to 6. . . . The scores of the individual matches were as follows: (Women's Singles) . . . Miss Elsa Vorwerk, of Niagara Falls, defeated Miss Bolard of Erie, 6-3, 6-3. . . . (Women's Doubles) . . . Miss Vorwerck and Miss Stephens, of Niagara Falls, defeated Mrs. Code and Miss Boland, of Erie, 6-3, 6-4. Elsa Vorwerk appeared in the 1936 Niagara Falls, New York, City Directory at 1638 Ontario Avenue listed as assistant purchasing agent for Niagara Wall Paper Company..
Elsa Vorwerk appeared in the 1938 Niagara Falls, New York, City Directory at 1638 Ontario Avenue listed as assistant purchasing agent for Niagara Wall Paper Company..
Elizabeth Susanna Margaret Kammerer appeared in the US federal census of 1 April 1940 in Niagara Falls, New York. Other members of the household included Elsa Vorwerk, Frederick Augustus Vorwerk. She was employed as purchasing agent by Niagara Wallpaper Company, according to the 1930 census. The following appeared on circa 19 January 1941 in the Buffalo Courier-Express: (Niagara Falls, Jan. 18) One of the busiest career women in this city is Miss Elsa Vorwerk of Ontario Avenue. Daytime she is purchasing agent at the Niagara Falls Wall Paper Company, one of the large plants here. Evenings she frequently devotes to mimeographing of church bulletins and other material. Week-ends she is choir director and soprano at Pierce Avenue Presbyterian Church. /P/ And at the moment, in addition to all this, she has a special project to command attention. It is the massed choir concert to be given at the Pierce Avenue Church Tuesday night, February 11th, under auspices of the Falls branch of the Buffalo Chapter of the American Guild of Organists. 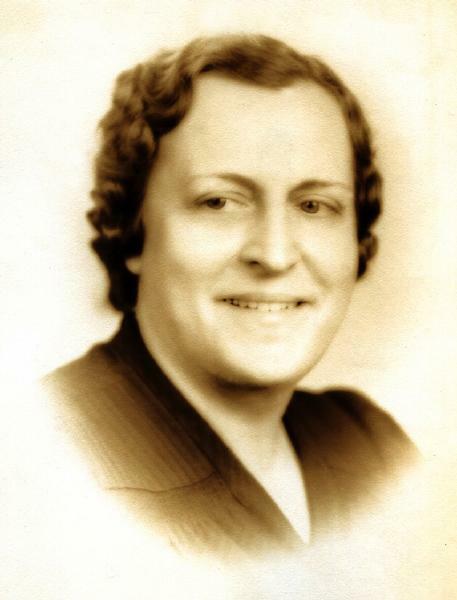 She is program chairman for the event, and is arranging to brigh together that night several units, such as the choir of the First Baptist Church, which is under direction of Florence Tschabold Smith; that at St. James Methodist Church, of which Eleanore Schweitzer is leader; First Evangelical, where Miss Olive Eberling is musical director; Bacon Memorial Presbyterian Church, Felix Hartwig; First Methodist, Robert Pearsonk, and Zion Evangelical Lutheran, Carl Heywang. The individual directors will lead in their own presentations, and Helen Clement Martin in the group offering of Haydn's The Heavens are Telling. Robert W. Stirling will be accompanist. There are family musical traditions surrounding Miss Vorwerk. Not unusual is it therefore, she insists, that she not only sings but plays the organ and composes sacred melodies. The following appeared on 27 October 1952 in the Niagara Falls Gazette: Office Services - Public stenographer, typing, mimeographing, mailing. Notary Public. Elsa Vorwerk, 1638 Ontario Ave. dial 2-3935. The following appeared on 12 October 1963 in the Niagara Falls Gazette: The Commission on Worship, James L. Swartz chairman, has announced the appointment of Miss Elsa Vorwerk as director of music at the First Baptist Church. A prominent musician, voice teacher and choral leader in this city, Miss Vorwerk has had extensive vocal training and has attended seminars and church music institutes led by Dr. Roberta Bitgood, Dr. Elaine Brown, Dr. Clarence Dickinson, Hans Vigeland, and other outstanding church musicians. /P/ She is secretary of the Niagara Falls Chapter in the American Guild of Organists and previously served as dean for three years. As director of music, Miss Vorwerk will be responsible for the direction of three choirs at the First Baptist Church. The choirs will be presented to the congregation at a special service of dedication Sunday at 10:45 a.m. Under the leadership of Rev. Edward Gunther, the choirs will be consecrated to their sacred task with members of the congregation participating. The musical portions of the service will be sung by the three choirs under the direction of Miss Vorwerk, accompanied by Mrs. A. G. Abendroth, interim organist. Miss Vorwerk and the members of the choir will be guests of honor at a coffee hour immediately following the morning service, when members of the congregation will have an opportunity to express their appreciation for the music so consistently rendered. /P/ As the Children's Choir is dedicated, they will sing "We Give our Youth to Thee" by Peace. "A Psalm of Praise" will be the response to the charge to the Youth Choir. The Senior Choir will present "Sing Praise to God" arranged by Williams. Rev. Edward Gunther, pastor, will take as his sermon topic "When We Worship." The following appeared on 17 September 1969 in The Niagara Falls Gazette: Lewis A. Barber has been elected president for the coming year of the Life Underwriters Association of Niagara Falls. He succeeds Edward M. Manning, who, along with Laura M. Benham, Naitonal association committeeman, are included in the association board of directors. Elsa Vorwerk is executive secretary of that body. . . .
At the time of her death Elsa Vorwerk was living in Niagara Falls, Niagara County, New York, at Seventh Street. 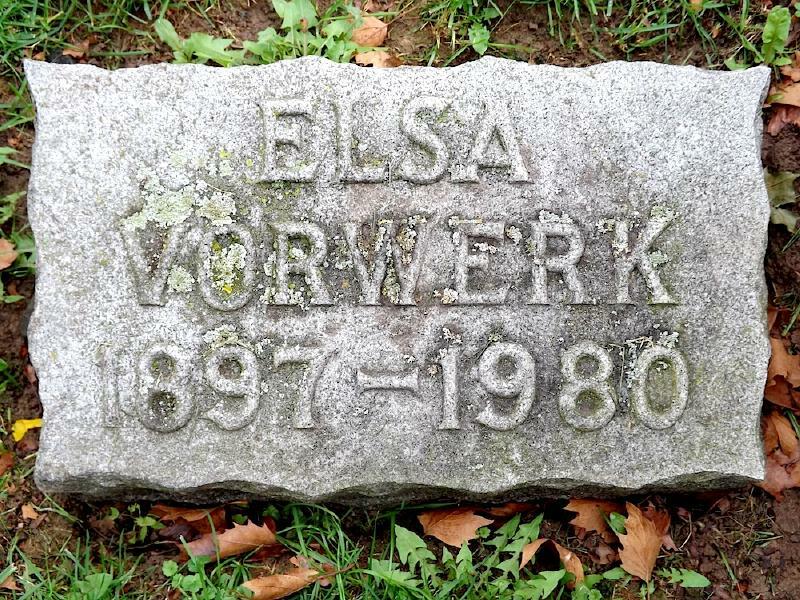 Elsa Vorwerk died on 7 July 1980 at age 82 in Niagara Falls, New York. She was interred at Oakwood Cemetery, Niagara Falls, Niagara County, New York. The following appeared in the Niagara Falls Gazette: Elsa Vorwerk, 82, formerly of Seventh Street, died Monday (July 7, 1980) in Memorial Nursing Home after a short illness. A native of this city, she was a purchasing agent for the former Niagara Wallpaper Co for over 30 years and was an executive secretary of Life Underwriters Association. She was also a choir director, church organist, piano and voice teacher, a member of the Zion Lutheran Church, the American Guild of Organists, the Society for the Prevention of Cruelty to Animals and a former member of the Zonta Club. She was the sister of the late Frederick A Vorwerk, who died in 1977. She is survived by an uncle and several nieces and nephews. Funeral services will be held at 1 pm Friday in the Otto Redanz Funeral Home, Michigan Avenue and 10th Street with the Rev Schatzi Schmidt, pastor of the Zion Lutheran Church, officiating. Burial will be in Oakwood Cemetery. Friends may call from 2 to 5 pm and 7 to 9 pm Thursday at the funeral home. Memorial contributions may be made to Zion Lutheran Church.